A bunch of MIT guys decided to invent a swarm of micro LED-equipped heli-robots that would hover autonomously in the sky and create massive works of floating 3D artwork. Their idea is based upon each heli robot, who carries a led and can be synchronized with the others so that can produce 3d artwork in the Sky. The project is called Flyfire and it is initiated by the SENSEable City Laboratory in collaboration with ARES Lab (Aerospace Robotics and Embedded Systems Laboratory) aims to transform any ordinary space into a highly immersive and interactive display environment. 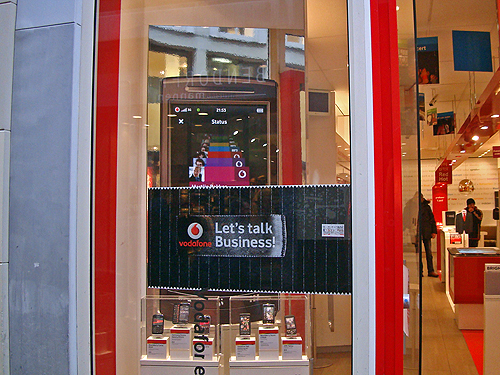 During our days in Amsterdam, for ISE 2010 we stumble upon a digital signage installation in a local Vodafone shop. 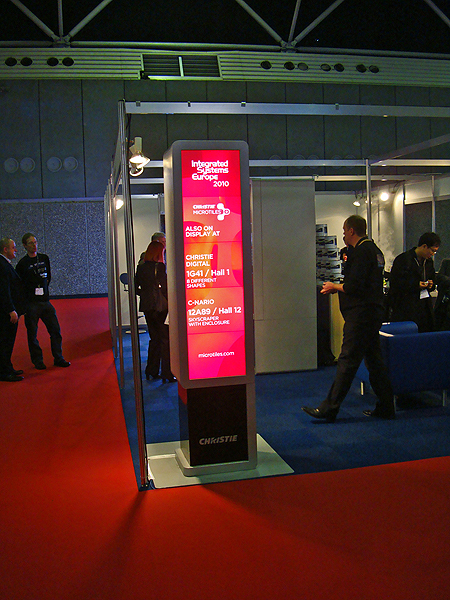 I thought that only Vodafone Greece was bad in Digital signage solutions by using digital frames with powerpoint like content. As you can see from the photo and the following video, the HTC product isn’t having the greatest impact, since the poster of Vodafone is obstructing the viewers from the installation. Nice try guys, better luck next time. Our first, but not last impression was, that this year, people are betting on Avatar. I mean that we saw so many 3d TV Set, even 3D LED that we were waiting James Cameron to greet us from somewhere. 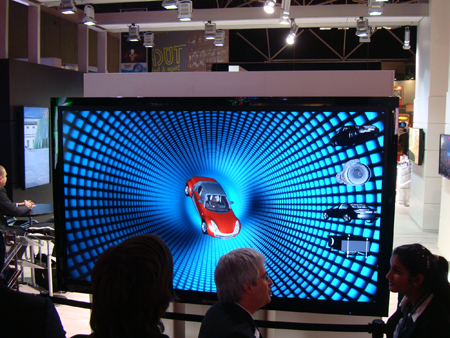 Of course the quality of all those 3d displays wasn’t so good, but we hope for the best. I wasn’t so amazed by the big LCD screen, based on the 10th generation glass panels from Sharp but I have to give kudos to Mr. Adrian J Cotterill for the idea of the bloggers lounge, something that we haven’t seen in so many big events and for sure not in a fair. His stands main attraction, is of course the Cristie Microtiles. In the following picture we can see the microtiles in a vertical installation, and from the right side Mr. Cotrelli to pass by. When we passed through we found out that the people on the lounge and also Mr. Cotterill where having a tour on microtiles for some visitors. Very good, for Christie.